I drive up to Vermont with a friend to vacation for a few weeks in this very pretty state that has controlled growth so well (one town recently stopped a Wal-Mart from coming in!) that there are still several small, quaint little villages that time has forgotten. Strip commercial and sprawl development all seem avoided. 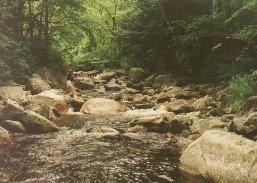 We hike the Long Trail, engage in wild-eyed mountain biking on Stratton Mountain (a big activity during the summer non-ski season), canoe the BattenKill River, see several covered bridges, and visit the very quaint towns of Woodstock, Manchester, see the Granite Rock Quarry, and the amusing Ben & Jerry's Ice Cream factory (where we get to sample a number of tasty ice creams, and learn how truly politically correct they are). The last New England state to be settled. The first state to prohibit slavery and the first to allow universal male suffrage. Dairy products lead the farm production. Over 22 percent of the labor force, however, is in manufacturing. Vermont leads the U.S. in production of marble and granite. Tall steeples dominate the many quaint little towns. The Long Trail is 260 miles long. Vermont has one of the highest concentrations of alpine ski and cross-country ski areas in the U.S. Statehood came in 1791.